2014 Domaine Vissoux-Pierre Chermette, Beaujolais Primeur (Nouveau) Gamay, France. This is really good good! Not your typical Beaujolais Nouveau, maybe that is why Pierre Chermette doesn’t label it Nouveau at all, there is a tiny “Primeur”sticker on the neck, otherwise it says Beaujolais only, and to tell you the truth it tastes way better than it should for such a new wine, and I think I’ll be quaffing a few bottles over the next month or so. The Domaine Vissoux/Pierre Chermette wines are wonderful examples of top notch Gamay and are surly some of the best offerings for the money in the region, and while I love Foillard’s wines if you are going to pick just one Nouveau or Primeur to drink this holiday/celebration season I’d go with the Vissoux/Chermette, it is more complex, deep and rewarding. 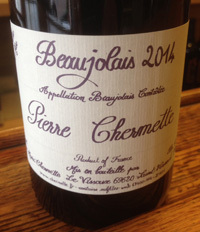 The 2014 Pierre Chermette Beaujolais Primeur is dark with violet/purple and garnet color, fresh flavors and surprising length showing a juicy plum, sweet strawberry, tangy cherry and dried currant along with hints of walnut, red peach and a mix of candied jells, plus a hint of earth, spice and mineral. There is a vibrant youthful zest and this is pure fun in the glass, but it has nice palace, elegance and a medium textural feel, making this fun little Gamay worth searching out, certainly a nice option for Thanksgiving table, and taking Nouveau to stylish heights! Drink now! In a world that takes itself way too seriously, this is a fun way to enjoy a few silly moments, and it is delicious.